Working in your alma mater’s communications office has challenges. Do I separate my alumni exuberance for more polite professional enthusiasm? How much do I insert myself as an alum versus a staff member? Do I throw a funeral for my favorite cast-off mascot? Ehrm.. So when an upcoming alumni magazine carried a love theme, did I speak up with a story that needs telling? That story is the shadowy world of dating with cancer. Sexuality is a hot button topic at survivorship conferences. Many doctors find the whole topic uncomfortable or secondary to their goal of making sure their patients live. But quality of life is important and more medical professionals are speaking up dating, sexuality, and fertility during and after cancer treatment. The opportunity presented itself when the director of the magazine wondered out loud about finding a story from a young alum. After a lively debate in my mind about whether I wanted to be quite so self-serving, I pitched my story. Flash forward a few months and my first essay was published in the magazine with a circulation of over 30,000. #cancerlebrity indeed. Approximately 72,000 young adults between the ages of 15 and 39 are diagnosed with cancer each year in the United States. Yet we exist in a parallel universe in which we both inspire and frighten our peers. No one expects to see a bald young woman. Even medical professionals avert their gaze, cluck their tongue and say, “You’re much too young for this.” Our shadow world of doctor’s offices is one few people really want to understand, not even the boy across the table, no matter how earnestly he asks. My first-date speech was rehearsed, every word weighed against my listener’s feelings. Saccharine-sweet lies were easier than telling the truth, which all too often had led to my comforting a date as he worried about his own mortality. As in any good elevator pitch, I painted myself as bubbly, enthusiastic and completely detached from any of the morbid fears concealed just below the surface. Each of those five exclamation points, coupled with a beaming smile, fended off real questions about life and death. Instead of talking about my fears of dying, I told him not to worry, twice. My mantra of positivity, so often heralded by others as a quality that could save my life, hid the true pessimist inside. First dates are not a place for anything less than optimism about the future. But if Dame Julie Andrews taught me anything in “The Sound of Music,” it was that “I have confidence the world can all be mine. / They’ll have to agree I have confidence in me.” These lyrics have been my pump-up song since I was a quiet, shy kid. I might have lost confidence in my body, which betrayed me decades earlier than I ever could have imagined. But I had confidence in my resilience. The rogue cells had momentarily taken over my body, but that did not make me any less witty or engaging. Pushing “pause” on my life was not an option. When I was diagnosed, I had a boyfriend. 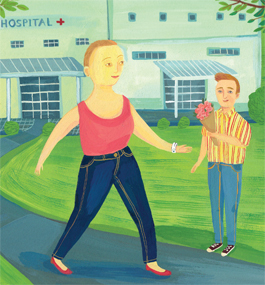 Like many significant others in the face of a partner’s serious illness, he held my hand and looked at me seriously when I offered him an “out” before I started treatment. Looking back, I realize it was an unfair proposition. Who leaves their girlfriend, even if she insists the breakup would not be devastating, when she is diagnosed with cancer? It is a little harder to dust yourself off when you’re going through a serious illness. Instead of eating a pint of Ben and Jerry’s, I made a vow. Even with cancer, I would date more people than my ex-boyfriend. Even while bald. Even when my body was swollen from the steroids. Even with the 60 pounds of weight gain that my lack of activity and changed palate left me with. I did not imagine he would really care, but vengeance through success is always the sweetest. Many people with cancer do not date during treatment. Others try to figure out how many dates they should have before they mention a cancer history. My approach was to put a large disclaimer about my illness at the top of my online-dating profile. I wondered if anyone would respond. After all, who wants to date a sick girl? Respond they did. The summer of my cancer was also the most active summer of my love life. I decided I would reply to any dating-site message that did not feel creepy. Many messages led to dates. These dates were my lifeboat of normalcy during the week, keeping me moored to a reality that did not involve sad waiting-room glances from fellow patients, some old enough to be my grandparents. Dating even offered a glimmer of hope for more intimacy than an oncologist’s exam or a monthly shot in the tush from an apologetic nurse. People touch you differently when you are sick, even though what you most need is comfort. A humid New England summer is not a good match for wigs or scarves. Eschewing standard cancer fashion, I mentally prepared myself for the stares my uncovered head would receive. Though I never lost all my hair, my buzz cut was another strike against the femininity I felt I was losing to illness. Watching hours of YouTube makeup videos, I learned how to make my face look like I was not already beyond the grave. Dramatic eyes drew attention away from my buzz cut. Low-cut tops took attention away from my head altogether. The dates themselves varied, as all first dates do. One man told me he was used to dating women with illness — his last girlfriend was in Overeaters Anonymous. Another asked if I was going to live another year. Most men were perfectly lovely. But it didn’t matter. Dating was normalcy. I got to be a feisty, attractive, interesting young woman whose future wasn’t precarious. In August, I will mark three years in remission. I have another two years to go before my medical team considers me “cured” (I am not sure if I will ever feel comfortable using that word myself). I have continued to date throughout remission. Although some relationships have been more monogamous and long-term than others, I am happy to have a commitment only to myself and my health for now. Love in a time of cancer is almost bound to be fleeting. But love does not need to be forever. Life goes on until it does not anymore. Being sick does not mean that your life has to end, just that it needs to change. Sometimes, for a moment, everything can be OK. Even though written in July, it just appeared in my inbox this morning. Nicely written, and glad to see you posting again. I reach five years in remission in just a few days … and I’m not comfortable using the word “cure” either. But three years for you, and five for me, signify good news. Stay healthy and keep writing. You caught me, Charley. 🙂 I’m spending the morning in a coffee shop catching up on the blog because I’d like to start writing more again but feel the oppressive guilt of more than a year without updates. I have written a bit in the past year but never got around to posting any of them. WordPress allows me to pre-date my posts. Since the article came out in July, it is helping me close the gap! So glad you have reached 5 years! !